Flaked out in the chairs in Faction, a fresh barbershop in the basement under All City Records, right beneath the heart of Dublin, there’s a sense of identity. It feels like a confident community is growing. The concept space is filled with lush green plants and illuminated by powerful halogen lights, to highlight the sharp fades and smooth trims done in here on the regular. 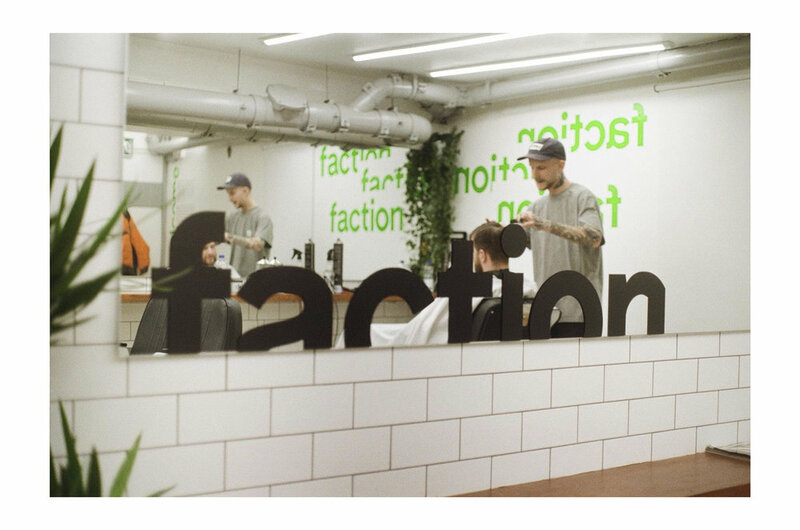 Rob Flynn and Aaron Kiely are the senior barbers in Faction, seizing the opportunity to run their own shop and shape it in their shared vision. Spending time in the basement, sitting in the chair getting a chop, chatting to the clientele, it’s clear the lads have a strong bond. Rob Flynn: “It’s a similar mindset. Two hair nerds. In the first shop we worked in together, Aaron heard I was cutting hair in his chair and he strolls in playing the tin whistle, fresh from a week’s holiday in Kerry. We thought they were having a laugh, but no, genuinely, Aaron gave Rob a ring. Some bromance they have. They’re well and truly in the honeymoon phase at the moment, and it doesn’t look like ending. The lads know what they’re trying to achieve with Faction and they have the motivation, skillset and ambition to achieve it. The name, Faction, obviously resonates with us at FAC and the concept behind it intrigued us. Despite being open only a few weeks, Faction already has a tangible atmosphere. The diverse greenery, the tunes banging, the characters passing through. As our chat went on, we wondered what it was like to operate in a shared space with the music and graff hub that is All City. Was it distracting or beneficial? RF: “Motivating. My background to Dublin is the punk scene. I was first cutting the hair of music heads. Once I started working in All City, it opened a whole new window, a new state of mind, new opportunities. The lads did note though that, sometimes, the tunes upstairs can be… varied. We got onto talking about desire to create a concept space, a room with an identifiable unique feel. The grey pipes and surfaces, the green plants, those halogen lights. The place feels like a different environment to any other barbershop. RF: “Organic is a word that sums up this transition. We were planting a seed, that’s why all the plants are in here. This is a proper greenhouse. This is a room with no outside light. Plants are there to purify the air. What the plants do is what we as barbers do. We try to bestow positive energy on people. Aaron and Rob have put a lot of thought into this. Every element from the shade of grey to the name of the shop has a reason behind it. 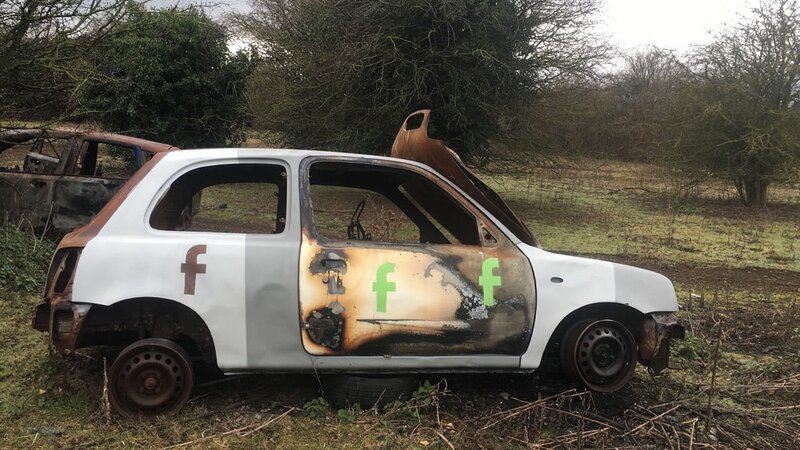 It’s a truly conceptual creative enterprise. That got us thinking, with barbering so popular that the culture allows these lads the opportunity to craft their own community and space off it, has it always been like this? Have haircuts always been popular in Dublin, or is this a recent phenomenon? RF: “I think the last ten years have been massive for Ireland in every creative field. The whole barbering thing in Dublin started to kick off maybe ten years ago, but about five years ago it became world class. That’s when the phenomenon turned into the culture. Men these days are so comfortable with their own appearance. Aaron’s had clients getting a haircut and then going getting their eyebrows done off his girlfriend (the make-up artist Kath Mulhall) then getting a sunbed. Same as hip hop, it was shunned for years, now you have Kojaque and Mango. That’s the same as the barbering scene breaking boundaries with men’s fashion and men’s looks. It’s a different time for Ireland. The votes have opened people minds. It’s not about following what you were told. People are trying to break out and make their own identity. That’s what me and Aaron did. We always wanted to work under our own name, our own identity. The creativity behind the project is obvious. Yet the job itself involves aspects of a trade, there are apprentice barbers and senior barbers. Everyone who wants to cut hair needs to learn their craft. Where does the craft and the creativity meet? Is cutting hair is an art or a science? RF: “I think modern barbering is a hybrid of both science and art. Sounds about right, a blend of skill and invention, adapting the trade to suit each individual mallet and taste. Finally, we wanted to know why these lads have put their working lives into cutting hair. What keeps them going, what’s the best thing about cutting hair? AK: "I’m after making so many mates through cutting hair. I cut the drink out a year ago, I had to cut out a lot of my mates too. Any time I went out during the summer was with clients I met. RF: “I will say that it’s the most gratifying feeling, it’s the best thing about being a barber. That look when we’re finishing off the haircut, when you see that look on their face, that’s it. Their reaction makes you know that there’s nothing else in the world you’d rather be doing. What I love is how different my life is because I started barbering. I left college with a level 7 media degree, didn’t know my arse from my elbow. Heading back to Tipperary, no plan, no vision. Follow Faction on Instagram here. Get Aaron here and Rob here, and shoutout to the other barbers, Gareth and Joe. Call into them under All City Records on Crow Street to get the sharpest trim of your life, but make sure to book in advance on the Instagram page to avoid disappointment, the boys book up quick.